The Evening Standard’s decision to downplay the extremism at last Friday’s ‘Al Quds’ day march in London – part of an international event inaugurated in 1979 by Iran’s Ayatollah Khomeini – was evident in the photo used to illustrate the story by Hannah Al-Othman (London pro-Palestine demo sees thousands take to the streets, July 4th). 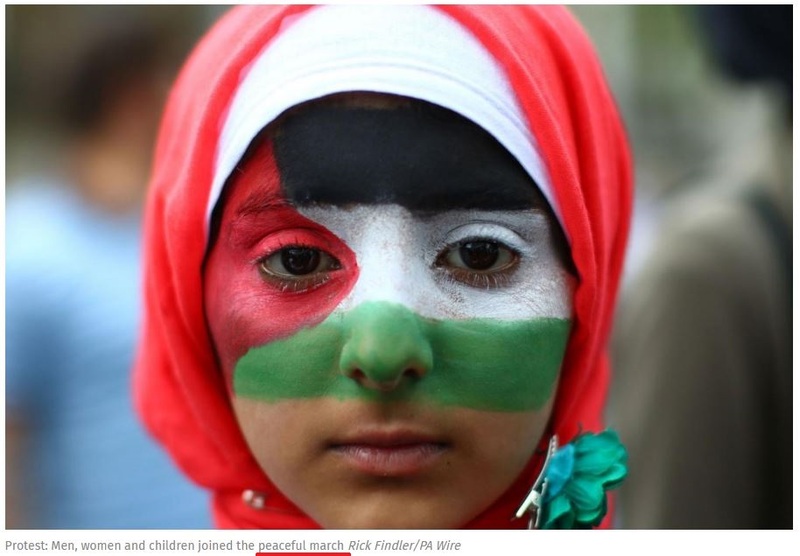 As you can see in the caption beneath the photo of the child whose face is painted to match the Palestinian flag, the march is characterized as “peaceful”, a word used again in the strapline to describe the event. However, though the march may have been ‘non-violent’ in the narrow sense of the word, the slogans of many protesters were anything but peaceful. David Collier (a blogger who attended the rally) and others reported that many marchers held flags of the terrorist group Hezbollah and posters supportng the group. Additionally, The Jewish Chronicle reported a banner at the front of the rally reading: “Dismantling of Zionist State = End Of Bloodshed.” Another man, according to The JC, carried a homemade placard which said: “Israel is a cancer. We are the cure”. 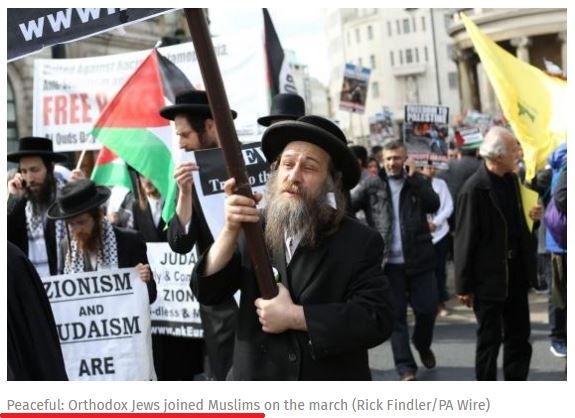 Muslims were joined by Jews in the rally against Zionism that started near BBC Broadcasting House in Portland Place, central London, at around 3.30pm. Pesach Shloime Hirsch was one of around a dozen Orthodox Jews who joined in with anti-Zionism protestors. The Evening Standard’s claim that “Muslims were joined by Jews” is extremely misleading. First, David Collier informed us that there were likely no more than seven Orthodox Jews who joined the march, not a dozen. However, whether the number is seven or twelve, to paint a picture in readers’ minds of a ‘interfaith march for peace and justice in Palestine’ based on the presence of a handful of anti-Zionist Jews is just dishonest. The article fails to inform readers that the Orthodox Jews in question were members of an extremely marginal anti-Zionist movement (with almost no support in the British Jewish community) known as Neturei Karta – a group “founded on the idea that Zionism is a demonic force”, and one which often provides a fig leaf for anti-Semites around the globe. Snapshot of Video: Neturei Karta members meet with former Iranian President Ahmadinejad in NYC, 2007. 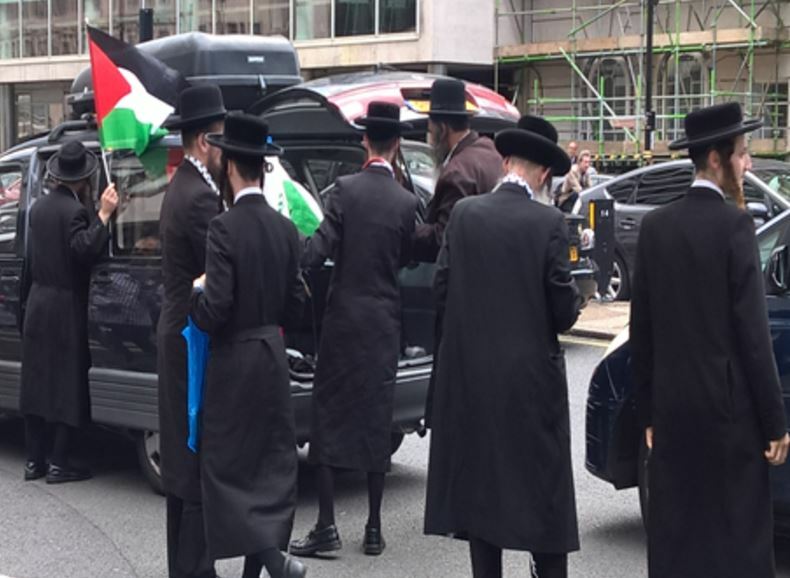 It’s one thing for anti-Zionists, like those marching in London last week, to cynically use Neturei Karta as cover for their extremism, but quite another for a mainstream British media outlet to parrot such propaganda by failing to provide even the minimal context necessary for readers to understand the insignificance of their presence. Independent op-ed scolds Elie Wiesel for his “blind spot towards the Palestinians”. Err, they are not ‘Orthodox’. They are mega-ultra-Orthodox at the very least (and furthermore, very disturbed people). British Media and Bowel Movements share more than initials. NYTrash and WP are the same. This site is named UK Media Watch. Hence, the focus of the comment. They are a sect of Judaism based back on the their founder about 300 years ago. They are deceptive and could be classified as non observant rather than orthodox because they ignore the commandment to dwell in the Land of Israel as prescribed in the Old Testament. Let’s show that sweetie pie’s face painted like a Palestinian flag. Then on the next page, we’ll continue to blame that girl for being stabbed to death in her bed. And in the Opinion section, we need to run not one but two editorials explaining how Elie Wiesel was completely oblivious to the suffering of the Palestinian people. After all, you have to be really desperate and in a lot of emotional pain to crawl through a bedroom window and stab a 13 year old girl to death. Shockingly absurd reporting. Thanks UK Media Watch for exposing it. Neturei Karta is the religious side of the Azajew spectrum (Jewish Voice for Peace or one of those gruesome JFJFP-type British groups would be the secular one) who get called upon to show that in a world with millions of Jews, you can find a handful who agree with the Irans and Hard Lefts of the world. They’re not a force or a real presence. That being said, one of my genuinely happiest moments EVER from reading on the anti-Israel movement was a time when NK went to a conference run by the worst of the worst in that area in full proud Azajew form, and were bluntly told they were nothing but dirty Jews and were not wanted or accepted. Loved reading how NK had to face the larger truth that all Azajews eventually notice and sometimes even take to heart (of course NK didn’t do the latter): they exist like condoms, to be ejaculated into and then thrown into the rubbish bin. I know that’s horrible imagery but its applicable here. Looks like Europe has found a brand new way to express a very old antipathy. Here we see just one more propaganda stunt as an illustration of this proclivity being past off as legitimate, courtesy the Evening Standard. Will they ever come to terms with the twisted historical revisionism they are presenting? Certain Jews can’t get into Israel as the Ultras won’t let them reside there.What’s going on? These people can’t really believe this anti stuff can they?? Zionism is all about the Jewish homeland & our right to be there. I suggest they move into Gaza & see the welcome that they’ll get. I doubt they’d get too far. Do the neteuri karta also live in Israel? If so, they should be deported, to Gaza, where anit-Zionists and “authentic” Jews like them can be within easy reach of bloodthirsty Hamass. That’s what I thought – Mea Sharim? Kick ’em to Gaza and lets see if Hamass will let “authentic” Jews build the infrastructure Orthodox Jews require (Synagogues, Kosher markets (food from Israel? ), Mikvahs, Yeshivas). Good test of Sand nazi claims of (anti-Zionist but not anti-Jewish). Reading Adam’s latest report on the Al Quds march in London a couple of thoughts struck me. It is how the Ultra-Orthodox have truly become useful idiots for the left wing media – if they have their religious schools, they can be attacked for their exclusivity and lack of integration. But when its necessary to justify a march calling for the murder of Israelis, they can be used to show that even Jews agree with Hamas and Hezbollah as if they represent a major group inside the Jewish community. Even stranger, in a way, is that this was an Al Quds march – where the mosques are heavily protected against ISIS and others by the Jewish state, while in Saudi Arabia, ISIS is trying to blow up the second holiest Islamic site! !